Bovada is one of the top rated and most popular sportsbooks and online poker rooms open to US players. And, all of the perks and extras offered at the Bovada sportsbook and poker room are also offered in their racebook. 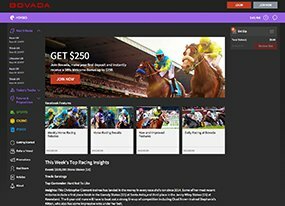 Whether you’re a horse betting veteran or you’re new to the game, Bovada Racebook has you covered with tons of betting options, horse tracks from around the world and easy-to-use software. At Bovada they outline all of the bets, from the simple win, place, show straight bets to the more complex exotics like trifectas. They also outline all of the upcoming races and major events on the horse racing calendar. Even if you don’t pick everything up right away don’t worry about running through your bankroll. Bovada offers rebates on straight wagers and exotics. Straight wagers receive a three percent rebate, while exotics pay back a five percent rebate. You can also give your bankroll an initial boost by taking advantage of Bovada’s 50% welcome bonus of up to $250 on your first deposit. Bovada also offers their Not So Dark Tuesday Promotion, so you won’t be bored when Del Mar and Saratoga take the day off every Tuesday. Under this promotion you can pocket $100 in free casino chips by betting on the weekend races at Del Mar and Saratoga. Once you’ve got your bankroll loaded, through one of Bovada numerous deposit options (Credit Card, Rapid Transfer, and Money Transfer) you’re all ready to bet on horse races at more than 90 tracks all over the world from your living room. Bovada Racebook also offers extensive coverage and wagering options on horse racing’s most famous events the Triple Crown and the Breeders Cup, including futures on the Kentucky Derby, Preakness Stakes and Belmont Stakes.